Worcester owner Cecil Duckworth is to step down as executive chairman after 22 years to become club president. Duckworth, 77, whose investment helped transform Worcester into a Premiership side, will have less involvement in the day-to-day running of the club. Although Duckworth is to remain on the board at Sixways, Jim O'Toole will be the man in charge when he starts work as chief executive on 2 February. Anthony Glossop, acting CEO for the past year, will be the new chairman. "I am now very happy to step up to the new position of president, knowing that the club is in good hands and that significant plans are in place to take the club forward," said Duckworth. "One naturally cannot go on forever, so about five years ago I started to organise a succession plan. I strengthened the board and brought in successful and experienced business friends whom I knew would be able to help to develop the club. 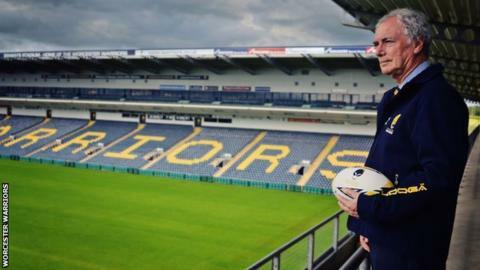 He sold the company to Bosch in 1992, and became involved with Worcester Warriors the following year. He was awarded a CBE in 2013. "We had come a long way from Midland One to the Premiership, but we had failed to kick on and be a top four to six side. Therefore our two priorities were to secure the appointment of a world class director of rugby and to ensure that the financial support for the future was in place. "Fortunately Dean Ryan was attracted to the idea that we were prepared to take the long view. I believe that Dean is one of the top six directors of rugby in the world and, since joining us, he has built a very powerful coaching and support group." The Warriors currently lie second in the Championship, vying with leaders Bristol for promotion in a season when they are chasing success on two fronts. Ryan's side have also qualified for the British & Irish Cup quarter-finals and will host Pontypridd at Sixways on Saturday week. Since losing to a try in added time at Bristol on the first day of the season, the Warriors have won 16 straight matches, including all six B&I Cup group games.